SPECIFICATION forming part of Letters Patent Ho. 545,732, dated Septemiber 3, 1895. Be it known that I, EDMUND A. SCHADE, a citizen of the United States, residing at New Britain, in the county of Hartford and State of Connecticut, have invented certain new and useful Improvements in Planes, of which the following is a specification. 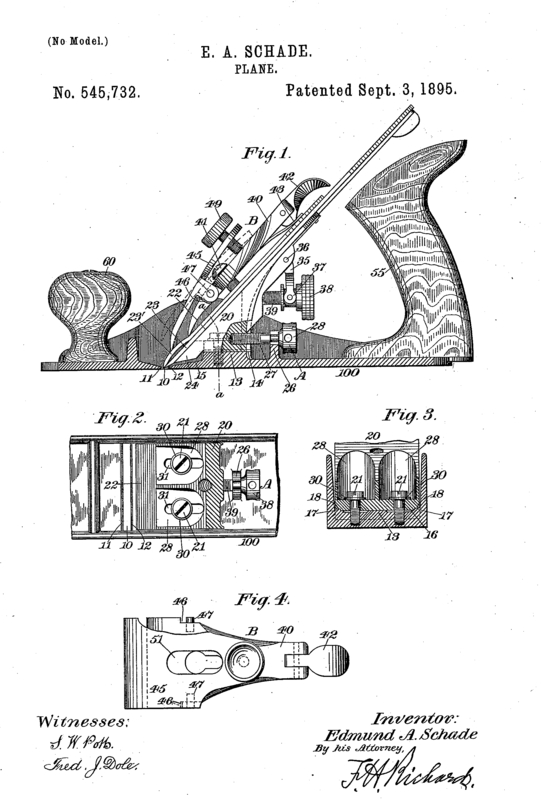 This invention relates to planes, and especially to that class of tools commonly known TO as "smoothing-planes," and it has for.its.object to provide an improved supporting and adjusting device for the plane-knife or plane-iron, whereby the same can be quickly and accurately adjusted with relation to the work to be done, and also to provide an improved clamping device for said plane knife or iron, whereby the same will be firmly held against vibration in the use of the plane. In the drawings accompanying and forming part of this specification, Figure 1 is a vertical longitudinal section of a plane embodying my improvements, parts of said figure being shown in full lines. Fig. 2 is a plan view of a portion of the plane, illustrating certain features of the construction, a part thereof being shown in section. Fig. 3 is a transverse section taken in line a a, Fig. 1, looking toward the right hand; and Fig. 4 is a top view of the improved clamping device detached, a part thereof being broken away. Similar characters designate like parts in all the figures of the drawings. This improved plane, in the preferred form thereof herein shown, consists of a suitable stock or body, designated generally as 100, adapted for co-operating with those elements in which my invention particularly resides. This stock 100 is shown as provided with a suitable handle 55 at one end thereof and with the usual actuating-knob 60 at the opposite end thereof. The stock has formed in its sole the usual transverse mouth 10, the forward wall of which is designated 11 and the rearward wall as 12. 27, provided with a suitable thumb-nut 28, is.journaled, the screw end thereof worliing in a suitable screw-threaded recess in the rear side of the carrier. By turning said thumb-nut the carrier-bracket will be adjusted to the desired position by sliding upon its horizontal support or seat toward or from the mouth of the stock. In order to adjustably secure or clamp the io carrier-bracket upon its seat or support 13, binding-screws 21 are preferably used and are passed through elongated slots 31 in that portion of the carrier which has its upper face in aplane parallel with the lower or seat-engaging face of the carrier-support, in order that the carrier may be moved relatively to its seat or support without effecting the positioning of the binding-screws, and to permit this the carrier is shown as having recesses 28 countersunk therein and communicating with the inclined face 22 of said carrier. Washers 30 are disposed between the heads of the bind- ing-screws and the horizontal upper face of the carrier-bracket, and said carrier-bracket, by means of the elongated slots 31, can be adjusted in longitudinal direction of the stock by means of the adjusting device A, herein- before described. By this particular construction and organization of the plane-iron or knife-supporting members of the plane iron or knife a perfect adjustment of the plane is obtained, and, moreover, a perfectly rigid support for the plane-iron or knife-carrier bracket is provided. Any suitable means for vertically adjusting the plane-iron may be used, but is shown as comprising a lever 35, pivoted at 36 to the carrier, and having its upper end in engagement with the cap- plate 23' for actuating the same toward and 40 from the plane-month, and thereby moving the plane-iron in the same direction. This lever has the usual forked tailpiece 37 engaged by a peripheral groove in an adjusting- nut 38, which works longitndinally upon a 45 screw or threaded post 39, fixed to the carrier. As a means for clamping the plane-knife 23 and its usual cap-plate 23' in position, I have provided an improved clamping device, designated in a general way by B, and which go comprises a main clamping-lever having a supplemental clamping-lever connected therewith, and thereby forming a double clamping-lever, which, in the preferred form thereof, is shown consisting of a main clamping-lever 40, working on a fulcrum-screw 41, disposed on the carrier-bracket and having pivoted to its upper end the usual actuating cam-lever 42, having its cam-face 43 in operative engagement with the upper face of the cap-plate. Pivotally connected to the main clamping- lever 40, at any suitable place thereon, and projecting beyond the lower clamping end of said lever, is a supplemental clamping-lever 45 of any suitable construction adapted for the purpose herein set forth and of comparative flexibility relative to the main clamping- lever. The main clampiag-lever 40 has recesses 46, and is provided with laterally-projecting pins or studs 47, upon which the 70 supplemental clamping-lever is adapted to swing by means of suitable ears or Ings 48, having apertures therein adapted to engage said pins or studs. As a means for adjusting this supplemental lever, the upper end thereof is provided with a suitable adjusting device, herein shown as a set-screw 49, adapted to work on the upper surface of the main clamping-lever. This supplemental clamping-lever also has an 'elongated aperture 51 to permit 80 the fulcrum-stnd 41 to be adjusted into position. By means of this improved clamping device, one lever of which is adapted to engage the cap-plate at a point beyond the Clamping end of the other lever, the knife Sc, or plane-iron is firmly held at different points near its working end, and vibration thereof in the use of the plane is substantially elimi- nated. 1. In a piano, the combination with a. stock, and with a plane-iron supported thereon; of a clamping device for the plane-iron compising two clamps, one of said clamps clamping 05 the plane-iron at a point in advance of the clamping-point of the other clamp, substantially as described. 2. In a plane, the combination with a stock, and with a plane-iron supported thereon; of ioo a clamping device for the plane-iron comprising two clamps, one of said clamps clamping the plane-iron at a point in advance of the clamping-point of the other clamp; and means for separately operating the clamps, substantially as described. 3. In a plane, the combination with a stock; of a carrier-bracket supported thereon; a plane-iron adjustably supported on said bracket; a cap-plate adapted to rest on said no plane-iron; and clamping means for said plane-iron comprising a main clamping-lever fulcrumed on the carrier-bracket and a supplemental clamping-lever pivotally adjustable on said clamping-lever and adapted to iig clamp the cap-plate at a point beyond the clamping-point of the main-lever, substantially as described. 4. In a plane, the combination with a stock; of a plane-iron adjustably supported on said 120 stock; and clamping means for said plane- iron comprising a main clamping-lever fulcrumed on the stock, and a supplemental clamping-lever pivotally adjustable on said main clainping-lever, and adapted to clamp izg the plane-iron at a point beyond the clamping-point of the main-lever, substantially as described. ing the cap-plate at a point beyond the clamp- ing-point of the other lever, substantially as described. 6. la a plane, the combination with astock; g of a plane-iron adjustably supported on said stock; a cap-plate adapted to rest on said plane-iron; and clamping means for said plane-iron comprising a main clamping-lever fulcrumed on the stock; and a supplemental io clamping-lever pivotally adjustable on said main clamping-lever and adapted to clamp the cap-plate at a point beyond the clamping- point of the main-lever, substantially as de- scribed. 15 7. In a plane, the combination with astock; of a plane-iron adjustably supported on said stock; a cap-plate adapted to rest on said plane-iron; and clamping means for said plane-iron comprising a double-lever, the 20 main clamping lever thereof being fulcrumed to the stock and the supplemental clamping- lever being pivotally adjustable on said main- lever; and means for adjusting gaid double- lever, whereby the adjustable action of the 25 combined levers extends to the clamping ends of both the main and supplemental clamping- levers, substantially as described. 8. In a plane, the combination with a stock; of a plane-iron adj ustably supported on said 30 stock; a cap-plate adapted to rest on said plane-iron; a main clamping-leverfulcrumed on said stock; means for adjusting said lever; a supplemental clamping-lever pivotally ad- justable on said main-lever and adapted to 35 clamp the cap-plate at a point beyond the clamping-point of the main clamping-lever; and means for adjusting said supplemental- lever relative to the main-lever and inde- pendently thereof, substantially as described. 9. In a plane, the combination with the 4 n J v  J.LJ. L� JJJ.L�LI~/) CYV VV LLJ YILLLUVIVY I1IY11 <JLJ.\J stock having a transverse month; of a horizontal carrier-support disposed thereon; and a carrier-bracket having a bearins-face substantially parallel to the horizontal face of the support, and adapted to slide on said support, 45 and also having a vertically-inclined side adapted to support a plane-iron) said inclined side extending below the bearing-face of the horizontal support to support the plane-iron- adjacent to the mouth of the stock; a plane- go iron adjustably supported on said bracket; means for longitudinally actuating said car- rier-bracket relatively to its support; means for adjusting the plane-iron on its inclined support; a cap-plate resting on the plane- gg iron; and a clamping device for said plane-iron comprising a main clamping-lever ful- crumed to the carrier-bracket; an adjusting device for said main clamping-lever; a sup- plemental clamping-lever pivotally adjustable on said main-lever, and adapted to clamp the cap-plate at a point beyond the clamping- point of the main-lever; and means for ad- justing said supplemental-lever independently of the main-lever, substantially as described. 10. In a plane-iron, the combination with a stock; of a plane-iron adjustably supported on said stock; a cap-plate adapted to rest on said plane-iron; a main clamping-lever fulcrumed on said stock and adapted to clamp said cap-plate and plane-iron; an adjusting device for said main-lever; a supplemental clamping-lever pivoted on the main-lever at , a point below the fulcrum-point of said main-lever, and adapted to clamp the cap-plate and plane-iron at a point beyond the clamping- point of the main clamping-lever; and an ad- justing device for said supplemental-lever, whereby said supplemental clamping-lever is adjustable independently of the main clamping-lever) substantially as described.